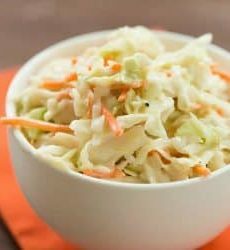 Buy a bag of shredded cabbage and carrots and you can have coleslaw in 5 minutes! In a medium bowl, whisk together the mayonnaise, vinegar, sugars, salt and pepper. Add the cabbage mixer a handful at a time, stirring to combine the dressing before adding more cabbage. Refrigerate for at least 2 hours before serving. Leftovers can be stored in an airtight container in the refrigerator for up to 3 days.